Lim Bo Seng moved to Singapore as a child, he led efforts to raise funds to help China fight Japanese invasion in the late 1930s. 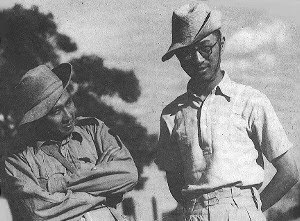 When the Japanese captured Singapore, he escaped to India and joined Force 136, a group of resistance fighters organized by the British. He was captured after infiltrating Japanese territory in 1944; despite punishment and torture, he refused to reveal the names of other resistance fighters. Major-General Lim Bo Seng alias Tan Choon Lim was a prominent Hokkien businessman who undertook active leadership in anti-Japanese activities during World War II and is recognised as a local war hero. Lim Bo Seng was the 11th child but the first son of Lim Chee Gee. At the age of 16, he came to Singapore and studied at Raffles Institution. He discontinued his education at the University of Hong Kong in 1929 when, upon his father's death, he inherited senior Lim's businesses which included the Hock Ann Biscuits and factories for brick manufacturing. In 1930, he married Gan Choo Neo, a Straits-born Nonya with whom he had seven children. It was a love marriage, unusual in those days. In the 1930s, Lim Bo Seng, under the alias Tan Choon Lim, participated in anti-Japanese activities in Singapore, particularly in supporting the China Relief Fund and also in activities organised by the Nanyang Federation to boycott Japanese goods. Upon the request of Sir Shenton Thomas, the Governor, he formed the Chinese Liason Committee to assist in civil defence. With the fall of Kota Bahru in Malaya in 1942, he, as the head of the Labour Services of the Overseas Chinese Mobilization Council, and Tan Kah Kee organised more than 10,000 men for the British Government to man essential services and to construct defences around the island. As the Japanese troops travelled to Singapore, his men helped dynamite the Causeway. On 11 February, he left Singapore and travelled to Sumatra with other Chinese community leaders and made his way to India later. He joined the British resistance group, Force 136, and was trained by the British for intelligence work. He then recruited and trained hundreds of secret agents through intensive military intelligence missions from China and India. Force 136 was a special operations force formed by the British and the Chinese governments in June 1942 to support resistance groups behind enemy lines and to coordinate guerilla operations in support of the eventual British invasion of Malaya. In May 1943, he sent the first batch of Force 136 agents to Malaya to conduct the operation codenamed Gustavus. The operation aims to establish an espionage network in Malaya and Singapore to gather military intelligence about the Japanese forces to aid the British in planning their re-capture of the colonies from the Japanese, codenamed Operation Zipper. It was set up in the urban areas in Pangkor, Lumut, Tapah and Ipoh. One of the Chinese provision shops in Ipoh, Jian Yik Jan, was used as an Allied espionage base. Communications between the agents were done by smuggling messages in empty toothpaste tubes, salted fish and diaries. Lim arrived in Malaya in November 1943 and used the alias Tan Choon Lim to avoid identification by the Japanese, claiming to be a businessman when he passed through checkpoints. Operation Gustavus failed before the agents managed to achieve any results. An unknown communist guerrilla was captured by the Japanese in January 1944 and they revealed the existence of the Allied spy network operating on Pangkor Island. The Japanese launched a full-scale counter espionage operation on the island and by late March 1944, more than 200 Japanese soldiers had landed on Pangkor Island. On March 24, the Japanese Kempeitai arrested a fisherman, Chua Koon Eng, at Teluk Murrek on the Perak coast. He was working on Pangkor Island when Li Han Kwang of Force 136 approached him and requested to use his boat for their communications. He also told the Kempeitai what he knew when the Kempeitai threatened to kill civilians. Li Han Kwang was later captured by the Japanese and he confirmed Chua's accounts of Force 136 under torture and then began to feign cooperation with the Japanese in order to escape captivity. Lim Bo Seng was captured by the Japanese under Marshal Onishi Satoru at a roadblock in Gopeng the next day. He was taken to the Kempeitai headquarters for interrogation but he refused to provide the Japanese with any information about Force 136 despite being subjected to severe torture. Instead, he protested against the ill-treatment of his comrades in prison. He fell ill with dysentery and was bedridden by the end of May 1944. He died in the early hours on June 29, 1944. He was later buried behind the Batu Gajah prison compound in an unmarked spot. After the Japanese surrender, Lim Bo Seng's wife, Gan Choo Neo, was informed of her husband's death by the priest of St. Andrew's School. She travelled with her eldest son to bring her husband's remains home later. A funeral service was held on 13 January 1946 at City Hall to mourn Lim's death. Lim Bo Seng's remains was transported in a coffin to a hill in MacRitchie Reservoir for burial with full military honours. He was posthumously awarded the rank of Major-General by the Chinese Nationalist Government. Jan 1942: Provided Chinese labour to British Governments to man essential services and build defence positions. Feb 1942: Escaped to India before Singapore fell. Underwent British intelligence training in Kahdakvasla, near Bombay in the latter part of 1942. Apr 1943: Recruited Malayan Chinese students studying in Chongqing, China for subversive work in Malaya. 27 Mar 1944: Captured by the Japanese. 29 Jun 1944: Died in Batu Gajah Jail under Japanese torture and because of severe malnutrition. 13 Jan 1946: The British brought Lim's remains to Singapore and reburied him with full military honours at MacRitchie Reservoir. 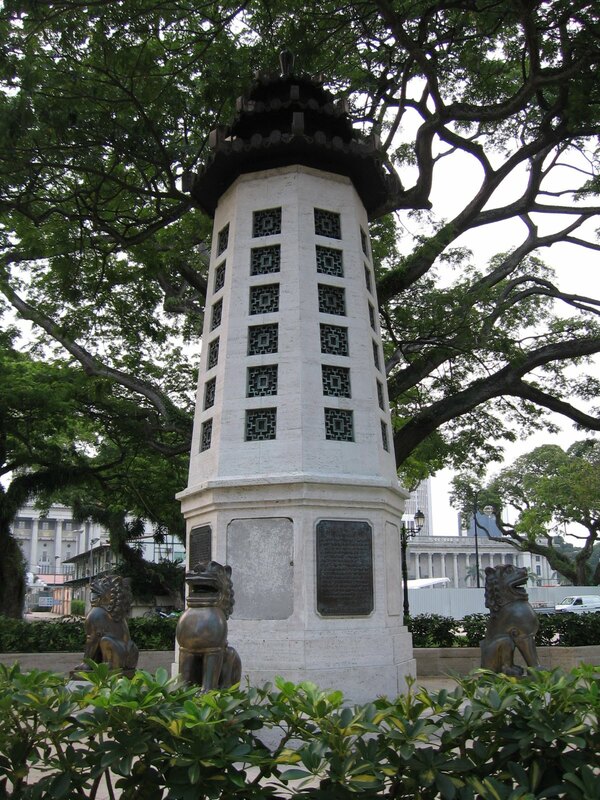 1954: The Lim Bo Seng memorial, a 3.5 m high pagoda, was officially unveiled at the Esplanade to remember the sacrifice he had given for the country. A hero is an everyday person that can change the world. Usually people think of heroes as people who fight crime in movies or comic books, but those people do not exist in the real world. In our world, anybody can be a hero like police officers, fire fighters, doctors, or people you walk by on the streets. A hero possesses many qualities and has many goals to accomplish. Heroes never stop no matter what obstacles get in their way. They persevere all the way to the end and may even risk their life to save another life. A hero is not someone that hurts another person or does bad things, but someone that helps people and improves their lives or change the world for the better. A hero doesn’t always fight crime or always have an opposition. They don’t even have to work with people; they could be designing a product that helps many people. For example, a hero who doesn’t necessarily work with people could be people who invent things. The person that invented the wheelchair is a hero because he has helped millions of people in the world. Without the wheelchair people who cannot walk would not be able to move around as easily. This person is a hero to people all around the world. A hero must always think of others first. Without this trait, a hero does not do any good because a hero is a person that affects the people around him. A hero also has to be humble. A hero must exhibit traits of selflessness. A true hero is always searching for a way to help others. If a person is always worrying about himself then how are they supposed to influence others? Some fire fighters sacrificed their lives to help others and this is why we remember these people today and will always remember them. This is what separates a hero from a normal person. A hero affects people and causes change. A hero is a person that everyone can look up to. A hero must be a leader but not one who puts him or her in power. A leader worries about themselves and whether they are doing the right thing and does not worry about their followers. This is because they know that if they are doing the right things, their followers will follow their example. By leading through example, followers will not question the actions of a leader. What makes a hero a hero is that they accept the call to adventure and overcome perils in a manner that requires courage and sacrifice. They may meet a guide or gain a companion who is with them through the adventure. The hero faces three trials and a reversal and the enemy. They must find a way to overcome the enemy. The hero may survive or doesn't survive the aftermath of defeating the enemy. However, whether they return or did not return home, they bring with them a key or a gift for those left behind. This key may benefit the community. In conclusion, heroes are people that accomplish great deeds. They are willing to take the risk and sacrifice themselves in exchange for something that will benefit others. There are many different types of heroes. Mr Lim Bo Seng is a sacrificial hero. But why is Mr Lim considered a hero? Firstly, he participated in anti-Japanese activities in Singapore, supporting the China Relief Fund and also in activities organised to boycott Japanese goods. He then formed the Chinese Liason Committee to assist in civil defence and joined Force 136, where he was trained by the British for intelligence work. His work required him to leave his family behind in Singapore, and had to face all the hardships and settle problems regarding the secret force. Even so, he still remained as a caring father and treated his children well by kissing them on their foreheads before he left for work. Through hardships, he recruited and trained hundreds of secret agents through intensive military intelligence missions from China and India. He set up an operation where its aim is to establish an espionage network in Malaya and Singapore to gather military intelligence about the Japanese forces to aid the British in planning their re-capture of the colonies from the Japanese, codenamed Operation Zipper. However, when the operation failed and Lim Bo Seng was betrayed, he was being captured by the Japanese soldiers and was tortured badly by them as they wanted him to tell them the names of the people in the secret force. However, he kept mum about it and revealed nothing despite facing all the harsh conditions, and even knowing the fact that he may die in the hands of the Japanese. "Since I’m in your hands now, I have nothing to say. I’m prepared to die." This was what Mr Lim said when he was being caught and interrogated by the Japanese counter-espionage headquarters. "Instead, he reminded the rest of us to remain firm and not to surrender to the Japanese." Mr Tan Chong Tee recalled what Mr Lim said when he was locked up in the prison. Mr Lim protested against the ill-treatment of prisoners-of-war by refusing food. He asked the warders to distribute his portion of sweet potatoes to the rest of his comrades. "Even when his life was hanging by a thread, Bo Seng still showed so much concern for his comrades. I was deeply touched by his noble character and kept pleading with him to eat. Bo Seng’s selflessness moved the warders, too." Mr Lim was later struck by dysentery, but he refused medical treatment. A few days later, Mr Lim was bundled up in an old blanket and left without food or water in an empty room meant for dying prisoners. For the next three nights, Mr Lim continued to struggle for his life. He finally died in the early morning of June 29, 1944. "I am very touched by what Mr Lim Bo Seng had done. He loved Singapore and Malaya with all his heart, and was even willing to lay down his life to win back his country. He is indeed a great man, a national hero." His loyalty and bravery will never be forgotten. So, are heroes only those who have achieved what they want to achieve or did they arise from some ‘special’ circumstances? Heroes do not achieve things for themselves. They think about others before them and they are always prepared to sacrifice themselves for others or even for a nation. If heroes were to achieve things for themselves, I bet the world would now be a terrible place to leave in as everyone, including people known as heroes, care only about themselves! Most people do not become a hero overnight. It is through their actions, words, behaviors, attitudes and the way they analyze and handle situations. One example of a hero that arises from some ‘special’ circumstances is LIM BO SENG. Lim Bo Seng was just an ordinary man who loved his family very much. He also cared a lot for Singapore during World War II when the Japanese were ill-treating the people living in Singapore. Lim Bo Seng was very caring towards his loved ones and that was also what made him persevere on. Singapore was where his family - his wife and 7 children – lived in. Therefore, he even needed to protect Singapore not only because for his family, but also because he cared for the well-being of the people living in Singapore. He joined the British resistance group, Force 136, and was trained by the British for intelligence work. Besides, he also trained many of his comrades who were in Force 136. Above is one point that made Lim Bo Seng a hero. He protected Singapore and defended her from the Japanese. Lim Bo Seng also travelled round many countries with Force 136 to recruit more secret agents to train so as to defend Singapore. This shows that Lim Bo Seng was very determined to defend Singapore and he had leadership qualities because he was able to lead his people and influence them into wanting to protect Singapore. When Lim Bo Seng was being locked up in the prison, instead of protesting for himself, he protested against the ill-treatment of the prisoners-of-wars by refusing the food given by the Japanese. He had even asked the warders to distribute his portion of sweet potatoes to the rest of his comrades. Although he was feeling really hungry himself, he thought about others and sacrificed what he had for others. That was another point that made Lim Bo Seng our hero. When he was being betrayed by a fisherman and got caught by the Japanese, Lim Bo Seng refused to let out any information of Force 136. He did not breathe a word about it despite the ill-treatment by the Japanese. He persevered on and struggled to stay alive. He was very loyal towards Force 136 until the day he passed on. He did not betray Force 136 like what the fisherman did. This is also a point that made Lim Bo Seng a hero because he was loyal. It was mentioned that Lim Bo Seng had showered a lot of care for his comrades even when he was about to die due to the ill-treatment in the prison. He was more concerned about his fellow comrades than himself. One of his comrades mentioned that Lim Bo Seng’s selflessness had also moved the warders. Lim Bo Seng’s selflessness is a point that made him a national hero. Our national hero, Lim Bo Seng was willing to lay down his life for Singapore. All the above mentioned points are a few out of the many situations that made him our national hero. Lim Bo Seng is definitely a hero who arises from many ‘special’ circumstances. We greatly appreciate what he had done for Singapore and her future generations and promised to defend Singapore if anything bad were to happen to Singapore. The definition of a hero is a person of distinguished courage or ability, admired for his brave deeds and noble qualities. In this world, anyone, be it a businessman or a cleaner, can be a hero. A true hero helps people and exhibits traits of selflessness. A hero helps people, influences them and whom people look up to. They benefit the community I some way and overcome perils in a manner that requires courage and sacrifice. ARE HEROS ONLY THOSE WHO HAVE ACHIEVED WHAT THEY WANT TO ACHIEVE OR DID THEY ARISE FROM SOME ‘SPECIAL’ CIRCUMSTANCES? Heroes can be of both types. A person that changes the world for the better, helping one person out, or helping millions, can be considered a hero. If a typical person plans to achieve the target of inventing a wheelchair, and have achieved it, he or she is a hero. That hero invented a wheelchair, making it easier for those who have difficulties walking or moving around, and there are millions of people in the world who have that problem. Special circumstances may be a situation where a person is drowning and a passer-by just jumps on and save a drowning person. Although that passer-by only helped a person, he or she is still a hero to the person he or she saved and the person being saved will look up to his or her hero. WHAT CHALLENGES DOES A HERO FACE? HOW DOES HIS/HER QUALITIES ENABLE HIM/HER TO OVERCOME CHALLENGES? Force 136 is group of resistance fighters organized by the British. Lim Bo Seng is one of them. Lim Bo Seng was caught by the Japanese for invading their territory. He was punished and tortured by the Japanese to make him reveal the names of the other people in Force 136. No matter how hard he was being tortured, no matter how in pain he was, he did not betray the other members by revealing their names. This shows that he was loyal to Force 136, and was sincere to fight off the Japanese. This will improve the lives of the other people who were captured by the Japanese. After he was captured, he became a prisoner. The food they had was insufficient. Although Lim Bo Seng had the same amount of food as the rest, he still shared his food with the others. He became sick, and died eventually. After knowing all the challenges that Lim Bo Seng had gone through, I agree that Lim Bo Seng is a hero. He sacrificed himself by sharing his food to the others, while he himself suffered. He also did not betray his fellow members as he knew that to fight off the Japanese, the other members cannot be captured, or else they will be lacking of manpower. This way, he helped the community and others. He always thought of others before himself, displaying selflessness. He is also brave and courageous, to make such a big sacrifice that benefit the community. These good qualities of Lim Bo Seng, also qualities of a hero, should be widely encouraged and followed, to enable a better society. I feel that Lim Bo Seng is truly a national hero of Singapore. He contributed and sacrificed himself for Singapore during World War II. As a World War II anti-Japanese resistance fighter, he led anti-Japanese activities like protests and boycott of Japanese goods to oppose against the Japanese. He was very brave and participated actively in the campaigns. He treated Singapore as his homeland and defended Singapore. He was not afraid of death or even leaving his beloved wife and 7 children. He was out there to defend Singapore! I am very impressed by his perseverance of not letting the secrets of Force 136 during the interrogation by Japanese despite them severely torturing him. Lim Bo Seng died in Batu Gajah Jail under Japanese torture and because of severe malnutrition (dysentery), but he remained silent about Force 136. He did not surrender to the Japanese until the last day of him. I feel very proud of him. Other Singaporeans like you and I, we are very grateful towards Mr Lim Bo Seng. All of us felt that he contributed a lot to Singapore and what she became today- prosperous and safe from war. Because of his great contribution to our people, a funeral service was held on 13 January 1946 at City Hall to mourn his death. His remains were transported in a coffin to a hill in MacRitchie Reservoir for burial with full military honours. He was posthumously awarded the rank of Major-General by the Chinese Nationalist Government. That was a great achievement to Mr Lim Bo Seng, as we, Singaporeans give him our due respect and we recognised what he, our national hero had done for us! Singapore, being a safe country now, is free from war or threatens from other countries. We were down during the Word War II. We would not have survived till today if it wasn’t for all the contributions that our heroes have done for us. LIM BO SENG, YOU ARE SINGAPORE’S HERO. A hero faces many different challenges. For Mr Lim Bo Seng, back then when Singapore and China were attacked by the Japanese soldiers, he did not just stood aside to watch but participated actively in activities organised to boycott Japanese goods and raise funds for the Chinese army. He even recruited and trained hundreds of secret agents through intensive military intelligence missions from China and India and set up the Sino-British guerrilla task force Force 136 in mid-1942 together with Captain John Davis. When passing through checkpoints, he claimed to be a businessman to avoid identification by the Japanese. If it was me, I may have just thought for myself and cared for my own safety. When the operation that he worked on failed, he did not give up. He continued to work secretly with other people, in hope that he will be able to defend the country. However, when the fisherman that Force 136 had requested to use his boat for communications was caught by the Japanese, he betrayed the Force 136 and this caused Lim Bo Seng to be captured by the Japanese. He was taken in for interrogation, but he refused to provide the Japanese with any information about Force 136 despite being subjected to severe torture. Instead, he protested against the ill-treatment of his comrades in prison. He fell ill with dysentery and was bedridden by the end of May 1944. Despite knowing that he will die soon, he still held on to the secret and did not leak out anything regarding the force. He rather chose to sacrifice his own life in order to achieve peace for the country. Wow, I am amazed with how selfless Mr Lim Bo Seng was! Despite all the harsh conditions that were given to him, he continued to keep mum about Force 136 and remained firm about not surrendering to the Japanese. One could easily tell that he was really loyal and patriotic even though he may not be a Singaporean. He did not spare a thought for himself, but selflessly cared for the others’ safety, especially towards fellow Singaporeans. He possessed many qualities of a hero, such as reliable, caring, fearless, considerate, selfless and loyal. He helped to improve people’s lives and change the country towards the better. He did not commit crimes but always empathised with others and put them before him. Despite being a senior rank official, he still remained humble and has many good leadership qualities. He was able to accept the task of setting up a force secretly, and even though he faced many enemies and still got captured and tortured badly, he remained loyal to the country by not telling them about anything relating to Force 136. Although it was sad to hear that he had passed on, his death made people realize the importance of defending the country. He also made people realized that how Singapore was so small and weak that it could be easily defeated by other big countries like Japan, and that how other big countries like British could not protect us and that we need to have our own military defence system to defend our own country. Since it is our own country, we cannot always rely on others, but have to stand as an independent country that is able to defend ourselves. Thank you Mr Lim Bo Seng, for all your sacrificial towards the safety of our people! We will never forget how you suffered to make Singapore a safe country it is now, and we will never forget how caring and doting you are as a father of 7 children. Thank you Mr Lim Bo Seng! You are truly Singapore’s hero! Lim Bo Seng, the Singapore war hero, he contributed so much to Singapore during the 1940s. What he had done during the World War II will never be forgotten.. He was an anti-Japanese resistance fighter. During the Second Sino-Japanese war, Lim Bo Seng participated actively in activities organised by the Nanyang Federation to boycott Japanese goods and raise funds for the Chinese army. He had put in a lot effort for the Chinese army and protecting Singapore. Despite the fact that he is a native Chinese who moved to Singapore as a child, Lim Bo Seng treats Singapore as his homeland. He led efforts to raise funds to help China fight Japanese invasion in the late 1930s. 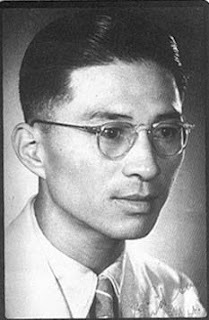 When the Japanese captured Singapore, he escaped to India and joined Force 136, a group of resistance fighters organized by the British. However, Lim Bo Seng was captured by the Japanese under Marshal Onishi Satoru at a roadblock in Gopeng the next day. He was taken to the Kempeitai headquarters for interrogation and he refused to provide the Japanese with any information about Force 136 despite being subjected to severe torture. He did not mention anything about Force 136, upon his heroic act, I feel proud of him. He protested against the ill-treatment of his comrades in prison. He fell ill with dysentery and was bedridden by the end of May 1944. Lim Bo Seng died young at an age of 35. He died in the early hours on June 29, 1944. He was later buried behind the Batu Gajah prison compound in an unmarked spot. Lim Bo Seng had undergo so much torture for the sake of Singapore, I believe every Singaporean will feel grateful of what he had done to Singapore. A funeral service was held on 13 January 1946 at City Hall to mourn Lim Bo Seng’s death. His remains was transported in a coffin to a hill in MacRitchie Reservoir for burial with full military honours. Lim was posthumously awarded the rank of Major-General by the Chinese Nationalist Government. Lim Bo Seng’s efforts will not be forgotten by Singapore. Being a safe and peaceful country, everyone thanks Lim Bo Seng. The torture he undergo, the efforts he put in, his braveness and perseverance, will be our heart forever. Lim Bo Seng, the loving husband, the caring husband of seven children, the national hero of Singapore..
During the time when Singapore was being attacked by the Japanese, he did not just sit there doing nothing, or ran away for his life, like what most people did. He, instead decide to go against the Japanese by raising fund for Chinese army. Also, he also recruited and trained the people who joined. Just by this fact, he had put in a lot of effort in for protecting Singapore and helping Chinese people. Also, it was said that Lim Bo Seng had shown a lot of care and concern for his comrades, even when he was about to die in the prison. He cared more for others than himself. He is truly a hero. THANKS, Mr. Lim Bo Seng for protecting Singapore with all your might. Singapore would not be like what it is today without you. Mr. Lim Bo Seng, a truly Singapore hero. One that we will not ever forget…. Here are some of the videos that we have found in tribute to Mr Lim Bo Seng, our war hero. This video may not show everything about Mr Lim Bo Seng, but it shows us how our forefathers stood by to defend Singapore. Do take note that for Mr Tan Kah Kee's profile, he was born on October 21 1874 and passed away on August 12, 1961.